Originally from Mumbai, India, Varish got his Bachelor's degree in Computer Science from the University of Mumbai. In 2008, Varish came to UMBC to pursue a Master's in Computer Science, and now he's pursuing his Ph.D. When he's not studying, Varish likes to read, play his XBOX 360, and hang out with friends. Me getting into Computer Science was an ‘accident’ of sorts! Although, I enjoyed taking basic Computer Science classes at my high school, I wanted to major in Chemistry or Chemical Engineering. When I applied for my undergraduate program, I did not get into a school with a good Chemical Engineering program, so I ended up taking Computer Science as a major. At the end of my first year of undergraduate education, I realized taking up Computer Science was one of the best things that happened! And here I am today, pursuing a PhD in Computer Science and enjoying every day of it! I am part of the Ebiquity Research lab in the Computer Science department at UMBC. My PhD dissertation research focuses on automatically inferring the intended meaning of tables and generating Linked Data from the inferred meaning. I am working on developing a system to infer the intended meaning of tables by jointly inferring the semantics of column headers, table cell values (e.g., strings and numbers), and relations between columns, augmented with background knowledge from open data sources such as the Linked Open Data cloud. Various applications, like search engines, can benefit from the inferred semantics of tables. In spring of 2011, I was involved in a research project that focused on extracting terms describing security vulnerabilities from text found on the web. Currently, I am also involved in a research project supported by NIST, where the goal is to automatically analyze medical literature on stem cell research to figure the most commonly used techniques (e.g. commonly used techniques to produce stem cell). I have had two internships to date. In the summer of 2009, I interned with Symantec Corporation in Columbia, MD. 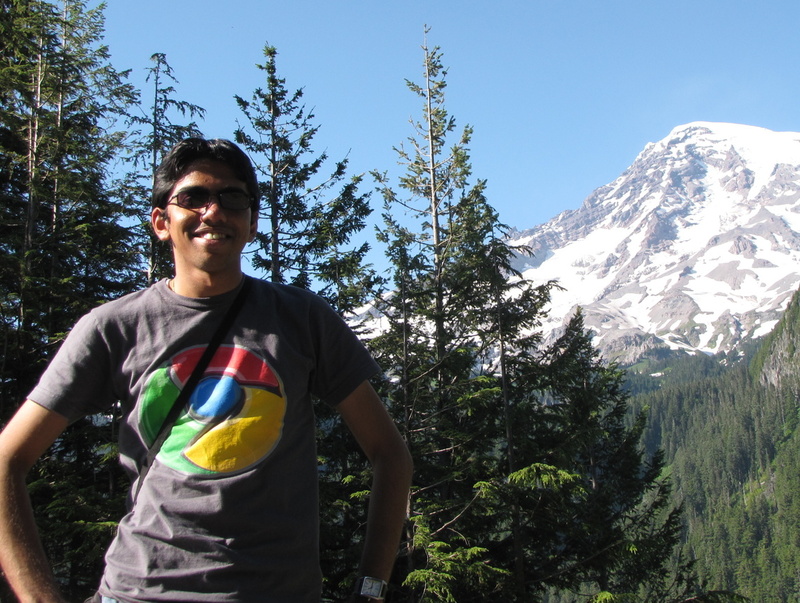 In the summer of 2011, I interned with Microsoft Bing. Both internships were an enriching experience and they provided me something that I could bring in practice, when I came back to graduate school to continue my course work and research. I would recommend students to seek internship opportunities over the summer. After graduation, I would like to continue to pursue research by joining a research lab in the industry. My dream job would be pursuing research in an industry research lab in India. I found the UMBC campus pretty. I liked the fact that it was smaller in size as compared to some of the other campuses, which allows you to explore and get around the campus on foot! I also liked the fact that, besides the library, there were many other quiet places around where one could sit and study. I started at UMBC in Fall 2008, when I began my Master's program. I chose UMBC because of the good balance the Computer Science and Electrical Engineering department provided in terms of advanced course work, opportunities for pursuing research at the Master’s level, and good faculty in the research areas I was interested in. My first CS course was CMSC 611, Advanced Computer Architecture, with Dr. Marc Olano in Fall 2008. To date, it remains one of the most fun courses I took. As a Computer Science major with little interest in architecture, I went into the class not knowing what to expect, yet getting to learn a lot in the class. It’s difficult to pick one favorite course, given that there are so many good CS courses offered. From the electives, I would recommend Machine Learning, Research Skills, and The Semantic Web. The CSEE department provides opportunities to pursue advance courses spanning across various areas and also encourages students to pursue research at the undergraduate and at the master’s level as well. As a graduate assistant and international graduate student, I have found the CSEE staff extremely patient and helpful (especially with the international students). The professors in the department are very helpful and approachable. It is also good to see that they are very active in both research as well as teaching. The first semester (or the first year) of graduate school, especially for international students, can be quite different and challenging to what they have experienced before. Work hard and hang in there and you will get through. It’s a good idea to talk to students in the department and to attend lab meetings to get to know more about the research being pursued in the department. Another good event to socialize would be the department’s weekly hi-tea event, where students and faculty interact over tea and snacks.